Due to a variety of influencing factors known as the social determinants of health, health and healthcare may be limited or nonexistent for many Michiganders. While some initiatives attempt to close that gap by addressing specific areas like dental care or senior health, others are taking a more holistic approach by tackling the health of an entire geographic region. By definition, place-based health initiatives focus resources and efforts in selected communities to create systemic change through interconnected approaches. These initiatives usually forge collaborative partnerships between the public and private sectors to improve health and wellness, economic opportunity, and cultural engagement throughout their communities. One such example is the THRIVE alliance in the Great Lakes Bay region, which is fostering place-based initiatives throughout Bay, Isabella, Midland, and Saginaw counties. 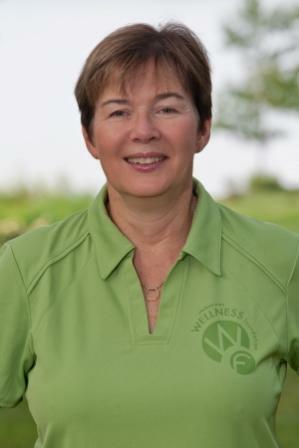 "We're looking at interdependence between health and the economy. 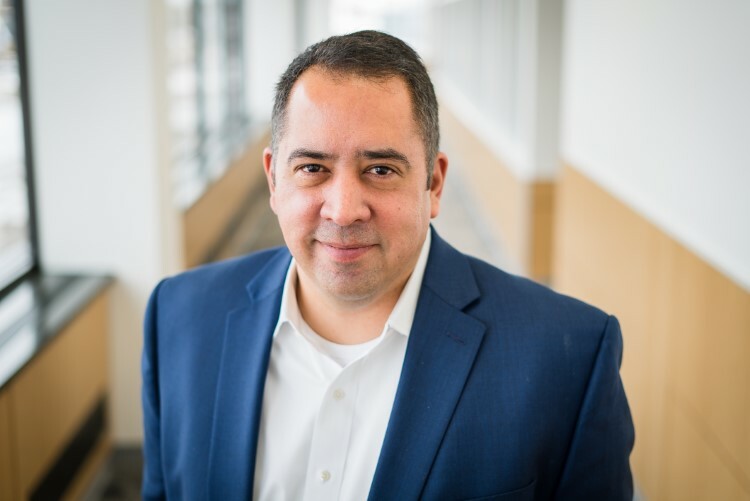 You can't have a strong economy with poor health," says Matt Felan, president and CEO of the Great Lakes Bay Regional Alliance, a collaborator in the THRIVE initiative. "A billion factors impact healthcare. If you don't try to make changes through the entire system, you are not going to impact healthcare the way you really want to." In southeast Michigan, the 5 Healthy Towns Foundation invests $350,000 annually into mostly free programs that aim to improve personal and community wellness in Chelsea, Dexter, Grass Lake, Manchester, and Stockbridge. The foundation was established in 2009 as a result of the merger between St. Joseph Mercy Health System and the former Chelsea Community Hospital. Amy Heydlauff. "All the money goes to programs that are available to everybody," says 5 Healthy Towns CEO Amy Heydlauff. "They might be focused on a certain population, but anyone is welcome. That's the biggest way that we are addressing health equity. The point is, all money is used to make sure that everyone has access." 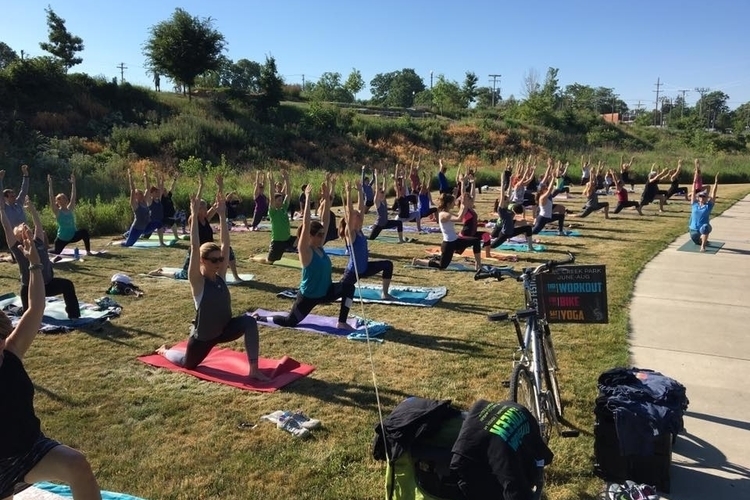 5 Healthy Towns-funded programs have included everything from trails, pathways, and free yoga in the parks to tokens for farmers market produce and scholarships to community wellness centers. 5 Healthy Towns funding has helped local hospitals and schools collaborate on a substance abuse program impacting youth, supported a residential facility for severely disabled adults, and created movement programs for elders. Yoga in the park in Dexter. "We're asking how we can change the local community culture," Heydlauff says. "We have a small enough service area that we wanted to go after it from lots of directions. As far as social determinants of health, we do not address all of them – for example, employment. But we would argue mental health and wellness gives people a solid foundation for employment and staying employed." Heydlauff's two favorite 5 Healthy Towns-funded programs involve ideas conceived by staff at local schools. One transformed a tired Stockbridge schoolyard into a thriving community wellness destination. Dirt excavated to make trails and improve the school's disc golf course was piled high to create a community sledding hill. A second, smaller 5 Healthy Towns grant purchased plastic sleds for the school's students. Heydlauff's other favorite program, Manchester's Walking School Bus, has inspired whole families to get outdoors for exercise. 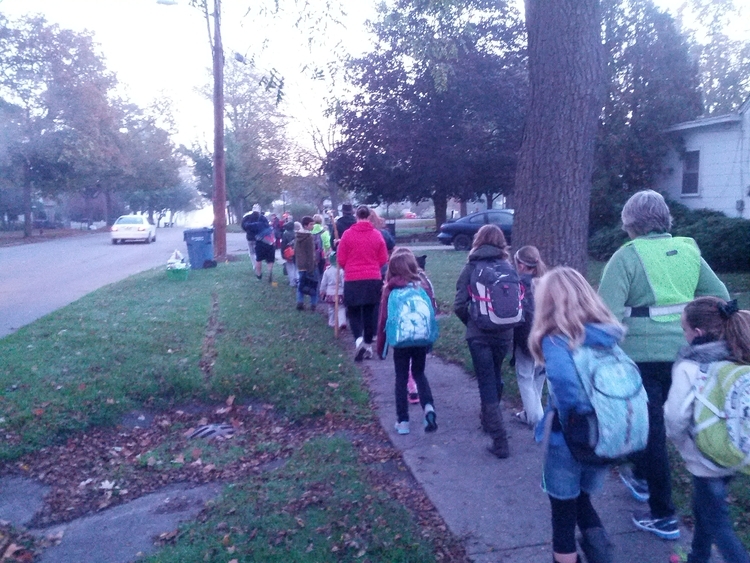 Organized by a teacher, the Walking School Bus is a large group of students and parents who walk to school together, "picking up" approximately 100 of the rural district's 600 students every Wednesday. "People love it. Parents are so excited for their kids as they stand and wait for it. On some days, the school band leads it," Heydlauff says. "Walking to school helps the kids to sit still in class. They are hungry for lunch and it makes them think about being physically active." Another of Heydlauff's favorites, Chelsea Senior Center's Intergenerational Garden, is a vegetable garden with programming that aims to bring elders and children together. "Once they got the garden built, the seniors went out and solicited a preschool, a summer camp, elementary schools, and a daycare to come and be part," Heydlauff says. "They set up programming, mini-curriculums, and cooking classes. That wasn't our idea. However, this is exactly what we are trying to do when we say we want to change a culture." Like 5 Healthy Towns, the Bay region's THRIVE program engages a broad base of collaborators. THRIVE, which stands for "Transforming Health Regionally in a Vibrant Economy," involves municipalities, businesses, nonprofits, and healthcare systems across the four counties it serves. "We're working together to build the region as one, erasing the dotted line between counties," Felan says. THRIVE partners hope to both improve health and sustain economic growth, two goals they recognize as going hand-in-hand. While THRIVE's work addresses business attraction, education, the arts, and more in addition to health, Felan says "the role of healthcare in our communities is gargantuan, a massive priority." THRIVE's health-focused partners include the Michigan Health Improvement Alliance (MiHIA), a central Michigan-focused health collaborative; and MidMichigan Health, an affiliate of the University of Michigan Health System. MidMichigan Health president and CEO Diane Postler-Slattery, Ph.D., sees reducing costs as one way to make accessing healthcare more equitable. 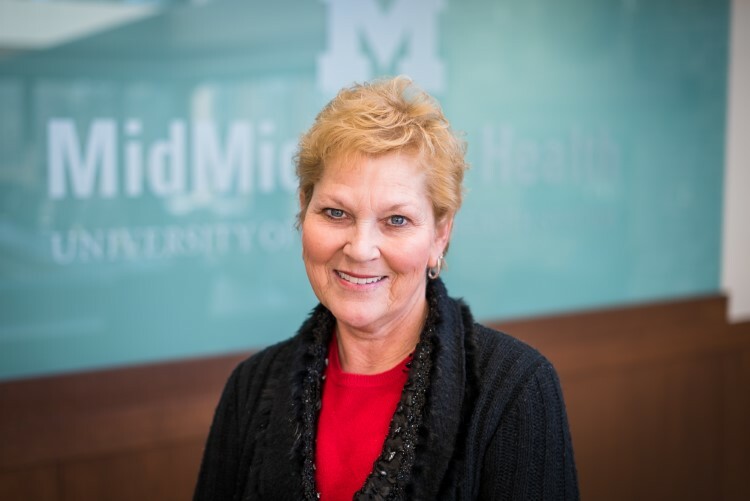 She says MidMichigan Health brings expertise in that area to THRIVE, thanks to its work investing in the University of Michigan Medicare Shared Savings program and its efforts to decrease costs at five other state health systems. In addition, MidMichigan Health gauged place-based community needs to develop preventive programs addressing issues like healthy weight, loneliness, opioid intervention, and post-traumatic stress disorder, which not only impacts veterans but also affects anyone who has experienced physical or emotional trauma. Postler-Slattery underscores the importance of addressing the social determinants of health, noting that MidMichigan Health has added questions about social determinants to its admissions questionnaire. "When we room a patient, it's part of the interview," she says. "Many times, patients can very much fully understand their provider's care plan. What we have uncovered (is that patients) can be actively engaged (and) nod their heads yes, but in their homes some of their basic needs are not met. If a patient has to choose between purchasing meds or food, they will forego their meds." THRIVE seeks to remove barriers and address those social determinants with a complex, holistic approach operating on the belief that a healthy economy is an important factor in health equity, and vice versa. "We're looking at the gaps in services, healthcare, and our transportation network. We see it as wanting to advance all sectors," says MiHIA CEO and THRIVE collaborator Beth Roszatycki. "Our role is acting as that organization that brings it all together. We each have a role to play. We need a multi-sector approach to do so. It just can't happen within the four walls of the health systems." 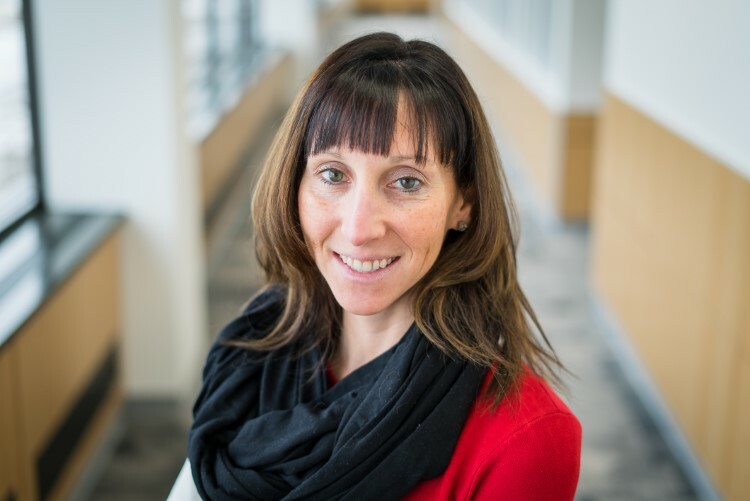 Estelle Slootmaker is the development news editor for Rapid Growth Media, communications manager for Our Kitchen Table, and chairs The Tree Amigos, City of Wyoming Tree Commission. Contact Estelle at Estelle.Slootmaker@gmail.com or www.constellations.biz.